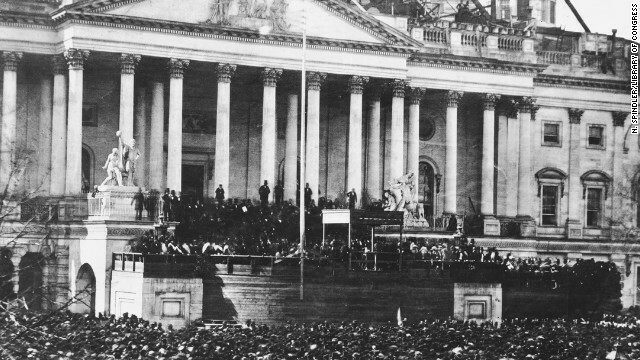 The inauguration of Abraham Lincoln on March 4, 1861. (CNN) - To paraphrase what Senator Charles Schumer said about tickets to the inauguration, this week's CNN Profiles is not for sale. This edition of CNN Profiles is a chance for people from all 50 states to get a deeper understanding of the presidential inauguration, not, as Schumer would say, "for scalpers to make a quick buck." That's why we're introducing you to American History Professor Leo Ribuffo. He leads us on a journey to inaugurations past to help shed light on the one around the corner. I never knew, for example, that George Washington intentionally kept his inauguration low key, or why. Professor Ribuffo teaches us. I never knew that Andrew Jackson had to escape his inaugural festivities through the back door of the White House, or why. Professor Ribuffo teaches us. Abraham Lincoln is on everyone's mind these days, because of the movie and the inspiration he has provided to our current president. Professor Ribuffo lets us know how he thinks Spielberg's story could have been more powerful. Professor Ribuffo also leads us to the very first inaugural address heard on radio - the first time the public was able to hear the address rather than read about it. As for one of the most famous Twitter-length thoughts in inaugural history - FDR's "the only thing we have to fear is fear itself ..." - there was more to it than that. Most important, perhaps, is what our inauguration history can teach us about politics today. Are we really experiencing the most divided government we've ever had? Don't get Professor Ribuffo started. Too late. We did. If you listen to CNN Profiles by clicking the audio player at the top of this story, right now, you may be the smartest person in the room come inauguration day. And it's free. No charge. Scalpers not welcome. Now, if you happen to have an extra ticket to Sunday's Falcon's game, let's talk.